Welcome to the Intelligent and Smart Package Lockers! eCommerce is here to stay and get stronger and more dominant every year, which means more and more packages! Package Nexus can take the packages off of your hand, so you can concentrate on your business. Our Smart Parcel Locker planners will improve utilization of your space, making your facility more efficient, your staff more productive, and your customers more loyal. Smart storage solutions sometimes go beyond shelving, storage, and mobile systems. With our wide range of Modular Smart Lockers, Enhanced Workflows, Best-in-Class Information and Material management systems — it’s safe to say the Package Nexus’ team members are Experts in transforming Your Space into A Smart Space. This is the first Smart Locker system on the market to be fully cloud enabled and connected. Its Smart Database and Application is based on a menu of features from the basic “open a door” instruction to full customer support and metrics on system performance. It also includes software to monitor every transaction, gathering metrics to help track performance, usage, and consumer interactions. Package Nexus Smart Lockers are powered by higher intelligence extending out the network edge in your facilities. Each locker is addressable to support field reconfiguration and “package present” sensors that connect the item to the cloud application by reporting when it is inserted or removed. This audit capability removes any uncertainty concerning individual locker status and helps to manage loss prevention. Conventional Smart Lockers utilize small, difficult-to-read displays with a limited Graphical User Interface. On the other hand, Package Nexus Smart Lockers, utilizes a 15″ or 22″ High-Resolution Industrial-Grade Touchscreen that supports a user-friendly interface and video display for customers as well as staff. Package Nexus Smart Lockers can also host many different peripheral devices to meet your unique needs, from Touchscreen Displays, Scanners, ID card readers, RFID Reader, Printers, Video Cameras, and Speakers. Smart and Intelligent Lockers can be a great solution to a growing problem only when done right. On the other hand, the installation of Smart Lockers can create enormous challenges for the end-users, facility managers, and the owners when the implemented Technology isn’t Optimized properly. We at Package Nexus have a great technical solution to the everyday last mile package delivery problems. We have 7 Patents Pending related to the Top 7 Package Delivery & Pickup Challenges the end-users of Smart Lockers face. Our unique technical solution will be your key to a successful Smart Locker implementation. Please contact us for more details about Package Nexus Smart Lockers 2.0. Enjoy the convenience of ordering online without worrying about the safety and delivery of the packages. Get notified when your packages have arrived, and pick them up at your earliest convenience. Package management is a growing problem for the college campuses. Packages are delivered to the dorms when students are in the classrooms or a lab. Don’t worry about finding the right person to accept the packages and give you a signature. Package Nexus will do all for you. Hotels can use smart lockers as another amenity and differentiating factor to attract more guests who value mobility. Allow your customers order online and pick it up as soon as one hour. Grocery shopping doesn’t have to be a hassle. Your customers can order groceries online, you store the groceries in refrigerated lockers and your customers pick them up on their way home. 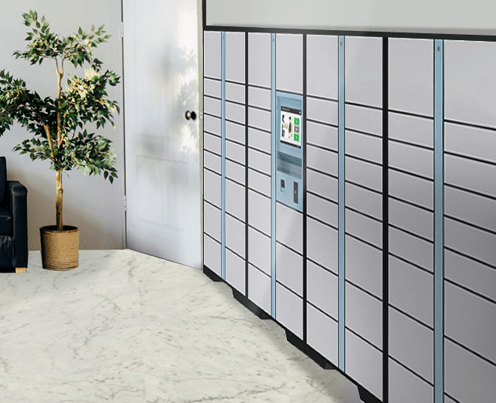 Public storage places can enhance their offerings by allowing their customers to ship packages to our smart lockers that can be picked up at the earliest convenience. Pick up and deliver dry cleaning orders from our smart lockers. Let your customers know they now have options. Know that your force has a secure and convenient way to store their gun and other valuable items and keep track of storage activities. The smart and ideal package solution for properties has arrived. Let’s get efficient and provide convenience for your residents at the same time. Save valuable library resources by depositing the books in safe and smart lockers instead of underneat the desk or on top of the counter. Shop anywhere online and provide your home address or the address of one of our public lockers. Our smart lockers work with all delivery companies. They deliver your package to our smart lockers, and scan it. Your receive a text and an email with a bar code and a super secret code to pick up your package. Your package is stored safe and sound in our smart lockers waiting for you until you retrieve it at your earliest convenience. It’s that simple. Unlike some other package delivery companies, Package Nexus’ founder is a technology veteran with 30 years of Information Technology experience. Smart package delivery systems are complicated technological products that have to work flawless for them to be user friendly, seamless, and easy to use. The combination of exceptional technology and customer service is our advantage point.